Another year, another Bumblebee. 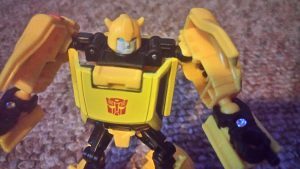 It seems Hasbro has a real love for making a multitude of Bumblebee figures year in, year out. This year is no exception with the Titans Return line bringing with it yet another version of this iconic little lovebug. I will admit, when it was announced, I was suprised they didn’t go deluxe on him and make him a Headmaster (sorry, Titanmaster) like everyone else who wasn’t one before. Don’t get me wrong; it’s a great little gimmick and I for one am glad it’s back as the Headmasters was one of my favourite lines as a kid, but not every character needs a transforming noggin. Anyway, that little rant aside, let’s take a look at the product. I am a big fan of the Titans Return line thus far despite my earlier tantrum. It far surpasses the previous Combiner Wars line in terms of quality and this little guy doesn’t disappoint. Coming to us in Legend-class size, he has some impressive engineering and sculpting which I’ll touch upon later. I’m going to start with his alt-mode. I’m not really a car-person so I couldn’t tell you if this resembles a ‘real-world’ vehicle but I can tell you its a lovely compact design with barely any robot on show. The only thing you can see if the back of the robot head if you look from the bottom. That’s perfectly acceptable in a world full of robot kibble hanging off of vehicles. It’s a surprisingly detailed alt-mode with a particular highlight being the registration number actually molded into the back bumper. Could perhaps done with a little more paint to pick out these details but it’s a minor quibble when you consider the size. It rolls along quite nicely with plenty of clearance underneath on a smooth surface. I’ve never been a fan of these ‘clip-on’ wheels that come on newer Transformers toys. They always feel cheap and prone to falling off. One thing that I found off-putting is how hollow the car feels until I realised that, just like Titans Return Wheelie, you can fit a Titan Master driver inside him. That’s a neat little feature. Now I need some more Titan Masters. 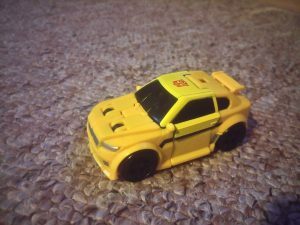 The Transformation is as you’d expect with any G1-inspired Bumblebee. Think back to your old 80’s toy, the bonnet became the legs, the sides became the arms and the roof is the chest. Not much has changed and that’s not a bad thing. You can always rely on Bee to remain consistent no matter how many makeovers they give him. One thing of note, however is that the back of the car is connected to the roof and kind of rolls up under the roof to fill out the chest. This is a genius move and is the impressive engineering I mentioned earlier. So this brings us to the robot mode. This couldn’t be more G1 Bumblebee unless it was actually G1 Bumblebee. Basically imagine if they had today’s sculpting and engineering capabilities back in 1984. The face-sculpt is a dead-ringer for his look from the old cartoon series. He has ball-joints on his hips, shoulders and elbows for a great range of movement. Seriously, this guy can pull off some impressive poses for such a small figure. If there is one thing I could pick at about this figure, it’s the shoulders. They’re huge and get in the way a little. It would’ve been nice if they could’ve been tucked away somewhere but given that he’s only Legends-class and is, otherwise, very impressive, I’m going to ignore this. To sum up, another great addition to the line. The detail is pretty good and with a little more paint, would really pop. Plastic quality is better than it has been on some recent Hasbro releases. Sure, it’s still a little thin in places but I never felt it could break while transforming. Price is another sticking point. £11.99 is what I paid! These things get more expensive every year. 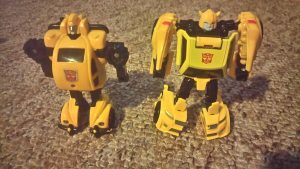 I would highly recommend this guy for your collection, depite the price, even if you’re sick of Bumblebee. He’s that good. Now, if I could get my hands on Gnaw….